After a wonderful stretch in the weather to start the spring time as we near summer, Portland is back in the very typical Rose Festival weather pattern: clouds and rain. While June 10 is Grand Floral Parade day (and I haven't been to it for quite a while), it's also match day for the Portland Timbers as they host FC Dallas in week 14 of MLS action. The last time these two sides met was April 29 in Texas when they were sitting at 1 and 2 in the Western Conference standings, and they played to a gutsy 2 all draw although Portland could likely be kicking themselves for not getting the full 3 points after 2 late defensive errors cost them points. Weeks later, the two sides have settled into 3rd and 4th in the current table with very similar records - 4 home wins each with 2 road wins, but FC Dallas has only played 13 matches and have a couple more draws on their record. The match on April 29 in Texas had many folks scared, especially with the Timbers and FC Dallas sitting 1 & 2 in the West going on. Portland led the affair on 2 separate occasions, but they couldn't hold the lead due to some defensive breakdowns. We eventually learned that Darlington Nagbe was injured in this match, which contributed to some of the issues, but otherwise, the match proved that Portland's offense was good enough at the time to score goals anywhere and at any time. The defense has been a work in progress, and over the last few matches, the backline has been better with Roy Miller and Liam Ridgewell keeping tabs in the center. The teams now sit in 3rd and 4th in the West, but FC Dallas continues to be strong defensively, having conceded only 11 goals in 13 matches played. Maxi Urruti is the big scorer with 7 goals so far this year, but midfielder Roland Lamah has contributed 4 goals and 1 assist, including a hat trick last week in FC Dallas' 6 to 2 win over Real Salt Lake. FC Dallas will have four players missing this weekend - Kellyn Acosta, Tesho Akindele, Matt Hedges and Maynor Figeroua while Nagbe and David Guzman will be away with their respective national sides. FC Dallas will also be missing the services of defender Walker Zimmerman, who is out 4 to 6 weeks due to injury. With this week's edition, we have an exciting new feature - reader contributions! 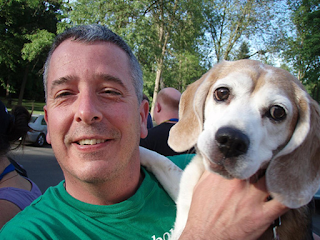 Mark Schofer, a long time reader and part time listener, asked about contributing to our mess of predictions, and after exchanging emails, Mark has agreed to see if he can outpick our crack crew of soccer experts and cats. 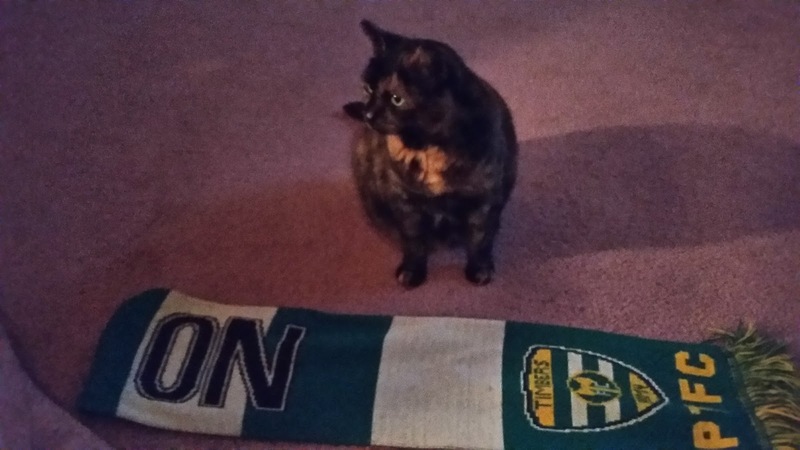 And yes, some of the cats are indeed soccer experts as well. If you would like to participate in a future post, please contact the management at pdxtimbersblog at gmail dot com, and your thoughts could be featured in a future article. Without further ado, what do our experts this about this weekend's match? Let's find out!! Honkers in their natural state. Portland haven't beaten Dallas (W0 D2 L3 F12 A7), home or away, since the 1st leg of the 2015 Western Conference Final in November 2015 when they won 3-1, with Ridgewell, Asprilla, and Borchers providing the goals. Both squads will be missing players due to international duty, with the absence of Darlington Nagbe (USA) and David Guzman (Costa Rica) hitting the Timbers' midfield hard. Once again I'll go with Adi and Valeri to score for the Timbers; Urutti for Dallas. This loss will emerge in the last few minutes. 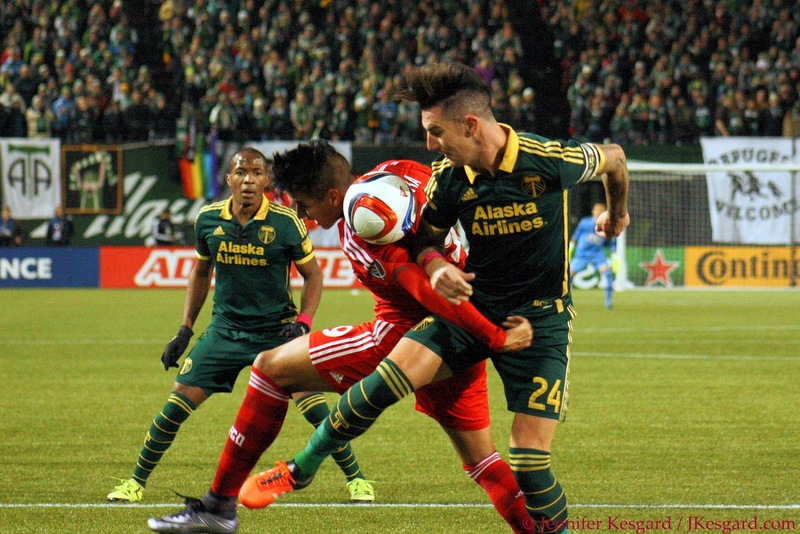 The Timbers will lead for nearly the entire match with the most dangerous 2 - 0, and then the tide will turn. This will mainly be because I'll be so pissed off about having to wear my rain suit and sit all soggy the entire match and near the end I won't be able to take it anymore. I'll start jumping up and down screeching about how cold I am, how unfair it is that Kip gets to sit in the press box with coffee, etc, that I'll be a terrible distraction. Three FC Dallas goals in quick succession during my meltdown will assure the loss. Following the match, Merritt will kick a ball at my head but I deserve it. Mark and friend. Welcome to the collective! If mystics picked soccer games at a close to 100 percent clip the Portland Timbers would finish the season at something like 26 wins 6 losses and 2 ties and a whopping 80 points. I glance at 538 and they break the game down win probabilities like this:Portland 44%, Dallas 29%, Draw 27 %. I really bit off more than I can chew here because I love Dallas’s side (I don’t root for them) and they are as dangerous as usual. One thing lately they have been consistent at is being inconsistent. They shellacked hapless RSL, and quizzically lost to San Jose at home so there is no trend line here. 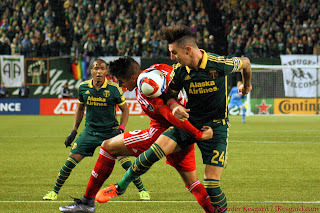 The Timbers coming off a muted 2 nil win of San Jose are also another conundrum. Picking this match is like predicting the flight of a hummingbird on caffeine.I will go with no in depth analysis. I will let the cats do that. I have a gut feel we will win this based on some home field quirk however I am going to be pragmatic here. The goals should come from Adi and Max Urruti. There will no red cards. I am making this prediction early as I don’t want to factor in officials, last minute injuries or Blanco going crazy and getting actual goals and assists. My debut prediction and it is banal as can be. Any other team, it would be different. Dallas is that good. 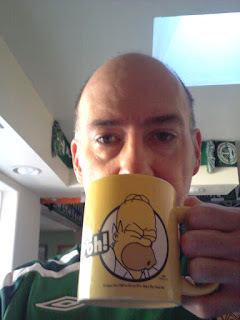 Coffee is good! Yeah, yeah, yeah! I'm actually disappointed that this is the last meeting between these two teams in the regular season because they actually produced one of the most entertaining matches this year for MLS back on April 29. There was a ton of back and forth action, and despite the Timbers being down in terms of players available, they actually were leading until conceding a goal for the draw. With Maxi Urruti coming back to familiar grounds, I can imagine FC Dallas is fired up to do well in Portland, but I am calling for the trio of Adi, Blanco and Valeri to provide enough firepower for the home side to get the win. Adi finally breaks out of his slump and gets his brace, but it's a late goal from Blanco that provides the difference in this one. Both offenses are very good, but FC Dallas' defense has been stellar all year and the Timbers' defense has been much improved, so this won't be a huge shootout as some might think. What's going on over there, guys? The sleepy gray boy was dozing when I asked him about this weekend's match, but he perked up slightly when I mentioned the opponent. After some initial happy thoughts and purrs for the Timbers, his demeanor changed greatly when he found out that Maxi Urruti now plays for FC Dallas. 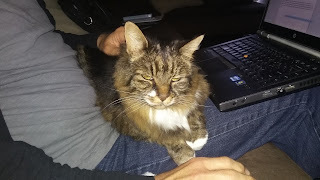 That fact alone led him to thump his tail a few times in support of the former Timbers striker in his former home park, so apparently the home side isn't going to be too happy on this night. I like goals. I like the brush, but goals are good, too. 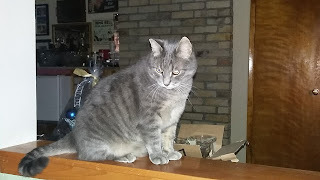 The cat that loves goals is at it again with her prediction, and this week's thoughts were all confirmed as she rubbed on the table while sitting in her favorite chair. After being non committal on which team would win, she rubbed on the table when asked about a draw between the teams. Asking about the number of goals for each side, she rubbed the table again when the count got to 3 goals. Six goals might not seem like much, but figuring that FC Dallas put up 6 last weekend against RSL, the cat may be onto something. I must supervise the entry of my prediction. The queen of the scoreless draws broke her streak of not picking anybody after a suggestion was made to solicit a prediction. After standing in between 2 chairs and telling Spot one represented FC Dallas and one represented Portland, she jumped on the Portland chair. When asked about the number of goals, she left 2 spots of drool on Kip's hand. Since she picked something, I am figuring this is a sign.